I was happy to stumble upon an article from Brooklyn Magazine on Mérida Anderson-an accomplished vegan chef, artist, and musician who runs the blog vegansecretsupper.com. This month Merida has released her new book Vegan Secret Supper: Bold & Elegant Menus from a Rogue Kitchen. Since 2008, self-taught chef Mérida Anderson has been hosting Vegan Secret Suppers for diners in New York, Montreal, and Vancouver. Her celebrated events are sophisticated, multi-course, plant-based meals that playfully blend haute cuisine with the spirit of community eating and social dining. At VSS, her celebrated events are modern, multi-course, plant-based meals that blend hip and playful haute cuisine with the spirit of community eating and social dining. In her new cookbook, as at VSS, Mérida creates sophisticated vegan dishes that prove spectacular dinner parties do not require the use of animal products. Here in her first cookbook, Chef Mérida opens up her kitchen and pantry to present luscious, unforgettable recipes using seasonal fruits, legumes, nuts, and whole grains, all while eschewing processed "replacement" foods of any kind. Innovative flavor pairings, inspired menu planning, and artistic plating tips help readers create luxurious, even decadent multi-course suppers perfect for entertain. 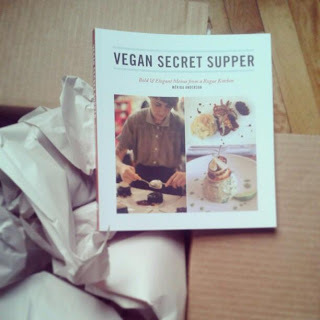 Vegan Secret Supper includes 150 recipes for breads, appetizers, soups, entrées, desserts (including ice creams), as well as sparkling water and tea infusions. The book features mouthwatering full-colour food photography throughout and photographs from Vegan Secret Supper events. favorite summer fruits, as well as the berries that follow. Q: What are your ten must-have, go-to favorite pantry items? Below is one of my favorite recipes from Vegan Secret Supper cookbook-Enjoy! Find our more about Merida and Vegan Secret Supper on her website and Facebook or buy her book here! That looks so good! I can't wait to make this!